Looking for the best Mediterranean, Persian, Greek and Middle Eastern cuisine? Then Nora's Kabob is the perfect choice. 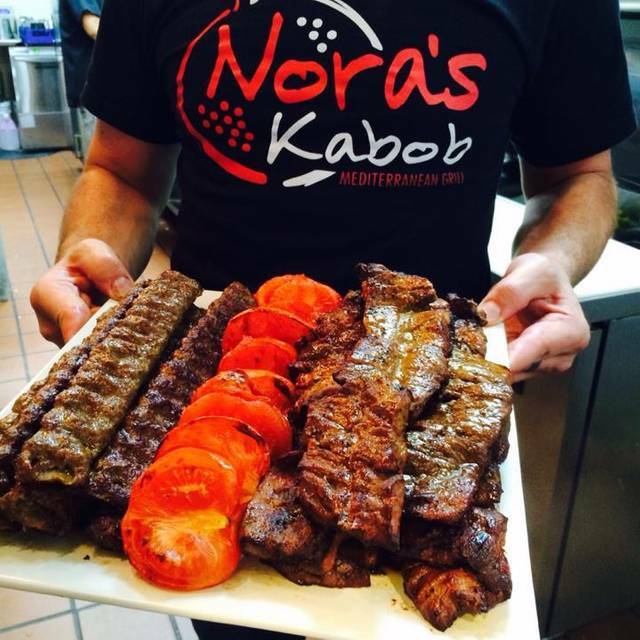 Come see why the Baltimore Sun wrote "You can feel the love at Nora's Kabob". Monday night, only one server, service a bit slow, but the server was very kind and accommodating. Good menu. Crowded tables and very little ambience though. Best gyros and kababs around. my only suggestion is to substitute tomatoes for zucchini. The service And food was Amazing. Very accommodating and wanting you to be completely satisfied. Definitely a popular place and quite the buzz in town. Making a reservation is a must if you have more than two people. You won’t be disappointed. Quite an unexpected treasure in a shopping strip mall. Food was very good. Portions large. Have gone by this place for many years and never stopped in. Tried it for the first time and the food and service were very good. Seating is limited, but definitely would go back. The food at Nora Kabob is always excellent. We've been there four times in the past 6 weeks, and we are always happy with our selection. The restaurant is clean and the service is great. Food very good, excellent service, consistently prepared in excellence! Sam was our waiter OUTSTANDING!! Kind, Warm, Attentive, Responsive. The food was fresh, plentiful & delicious!! Great local kabob, etc. place for eat-in or take out. Very good food and friendly service, good prices, with good sized portions. Been going there since they opened and it’s always great! The service and food were excellent. It is a small restaurant - even though we made reservations, we changed out table as we did not like where they were seating us. Would have been nice if they had given up a better seat to begin with. However, the food was worth the cold, chilly, small table near the door -- food is authentic and reasonably priced! One of my favorites! One of the area’s best kept secrets. The food is incredible. Nora's Kabob is a great spot for a casual meal. The beef kabob with pomegranate walnut sauce was delicious, and the meat was tender. I like the fact that you can get a half-salad and half order of rice as the sides. Both were plentiful. Love Nora's. Their lamb and chicken kabobs are outstanding. Price is right and the quantities are large. Nora's Kabobs has delicious food and friendly service. It's a great place to eat or carry-out. The food and service here are excellent. Highly recommend Nora. The place is small and busy particularly weekend evenings, reservations highly suggested. But remember the place is small, so if you make a reservation show up or be kind and cancel so they can let the table go. wonderful. Portions are large, especially for the price, which was very reasonable. I’ll be going back. Have been going to restaurant for 5 years now and the food and service are always great. The best kabob restaurant in Howard county. If you want Persian style kabob this is the place to go. Very good food. Large portions. Good value. Nora's has a classy and cozy ambiance and very good quality Persian food. The kabob is especially juicy and succulent. Good kabobs, served with rice and salad. The salad was delicious. The serving sizes are large--we took some of our meal home to have to lunch the next day. We love going to Nora's. People are really nice, food is great. Everyone we're taken there has gone back! Group of ten with a number of people unfamiliar with kabobs. Everyone loved the variety. Went back a second time to have the chicken and tenderloin kabobs. The greek salad and rice half and half with kabob choice is amazing and a bargain. You have to try this place. Would definitely recommend Nora’s Kabob. First visit to Nora's and we will be back! The gyros are outstanding! My son, who is very picky loved the chicken kabob and rice! The food was excellent and super friendly staff. We will definitely return! Delicious Mediterranean Food! Excellent octopus and eggplant dip. Generous portions too. Will go back again. So upset we haven’t eaten here before. The food was beyond amazing and the service was even better. Will definitely go back!!! Food very good. Excellent Rose' wine. Service a bit slow. Love Nora's Kabobs. Great food and great friendly service! The food is excellent. We always order the grilled octopus dish and mezze dishes there. Gyros and kabobs are good, too. My only complaint is the tight space. It is a VERY small restaurant. I have a family member in a wheelchair and it’s almost impossible to dine in with her unless we make a reservation well in advance to let them know about the wheelchair. It’s a bit pricy, too, but it’s definitely one of my favorite local restaurants. We had reservations for 9pm we arrived about 5-10 mins early. The waitress told us the restaurant is closed. Was rude and told us we had reservations for 845pm so we kindly showed her our conformation for 9pm and she still was rude and did not accommodate us. I don't recommend it. This place is a gem. Great restaurant, super menu for Mediterranean food. They never disappoint me. Wait staff is spectacular. Just the right combination of checking up on you without interrupting you. Kabobs are fantastic, always grilled well. Love the dolmades and the salsa type appetizer. I order the lamb, my wife the salmon, my adult children the chicken and everyone goes home happy. Quite a meal and a wonderful experience. We eat there every couple of weeks. This was our first visit to Nora's Kabobs and it won't be our last. A small, clean, casual restaurant in a strip center in Ellicott City is a great find along the shopping and fast food on Route 40. The food was well prepared and delicious--portions were very large and pricing was reasonable. What a gem! We made reservations although it was not crowded early on Sunday evening, but given its small size, it probably is a good idea to reserve. We'll be back for Nora's delicious Middle Eastern kabob's and other specialties. Hurray for a great place to eat in Ellicott City. Great food, great service, great value. Huge portions. We had a reservation and arrived right about on time. The place was backed and had a fair number of people waiting. I went over to check with someone who seemed in charge and saw my name was about number three or four on a list which I assume were reservations. We were told it would be about 10 or 15 minutes. Right! I could look across all the tables and except for one table for two, no other parties seemed close to be ready to depart. Unfortunately, we were a party of 4, so the 'table for two' wasn't going to help us. After about 15 minutes, we just left and went down the highway to Ernesto's where, without a reservation, we did get seated in 10 minutes. We really enjoyed Nora's the last time we were there, but this time was a total bust. That's why this may seem like an inconsistent review - I would not have rated all those factors but I could not submit this review without checking the stars. And yes, I have recommended it to others, but if I do again, I will warn them about reservations. Great experience just wish they knew about my open table reservation. Apparently it was never received by Noras from Open Table (I even showed the manager my confirmation email from OpenTable - this is not the first time this happened with Noras). Nevertheless they were able to accommodate my party but it’s unsettling that I went thru the trouble of making a reservation for it to be lost. Restaurant was nice... very tight though... Also seemed that some customers were treated preferentially. Our waitress did a great job though.